VW USB Flash Drive Kombi 16GB High Speed Memory Stick | Kombi Accessories | Catalogue | Righteous Kombis | Volkswagen Beetle and Kombi for Sale! With Retractable USB plug and illuminating headlights! The USB flash drive is cleverly concealed inside the trunk. When the device is plugged into the USB port of a computer, the headlights light up. Includes postage to anywhere in Australia! This Beauty is a large 16GB USB 2.0 Flash drive or Jump Drive ideal for desktop decor and transferring of large files like movies maybe you could load it up with some selfies, a video clip or movies or music as part of your gift. (Universal Serial Bus (USB) port is an industry standard developed in the mid-1990s that defines the cables, connectors and communications protocols used in a bus for connection, communication, and power supply between computers and electronic devices). 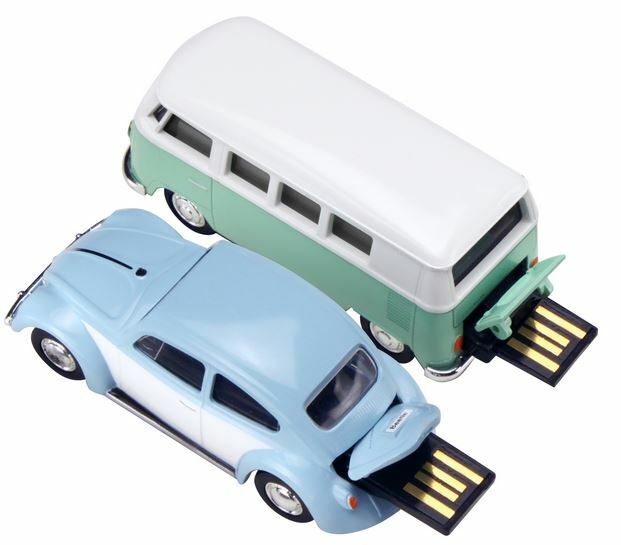 This USB drive is a licensed Volkswagen T1 Kombi replica, The USB flash drive is accurate to the smallest detail exceeding the expectation of worldwide fans. Officially licensed by Volkswagen GmbH.